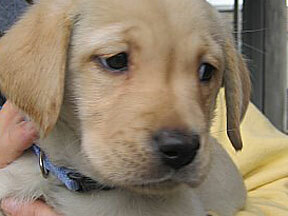 Tue, 10 Apr 2007 - Hi Alda: Last Thursday, Nell's had her routine GDB breeder Ophthalmology exam. 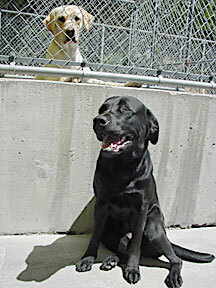 She has prominent sutures which does not effect her vision (Goggle-Canine prominent sutures.). However, it does effect her career as a breeder. Our beautiful Nell has been retired as a breeder. 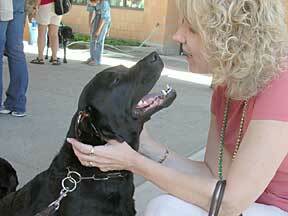 Nell will return to the Oregon campus in May to resume her training to be a guide dog. 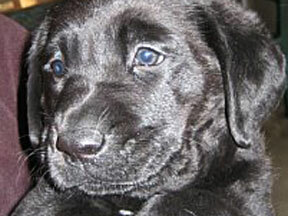 It's Nell's destiny to be a guide dog. We feel blessed to have shared in this noble beautiful creature's journey. To know Nell is to love her..goodbye girl. Love to all the breeder keepers and puppy raisers. Sat, 3 Mar 2007 - I saw Nell's pups today. I made a point of hunting them down as I realized that they were 8 weeks this weekend and would soon be leaving. 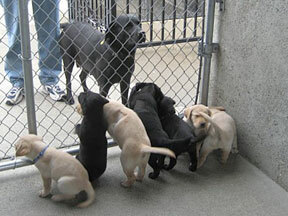 They were all in the puppy kennels and 3 of them were being socialized when I first got there. They are so tiny! They are the littlest 8 week old pups I've ever seen. 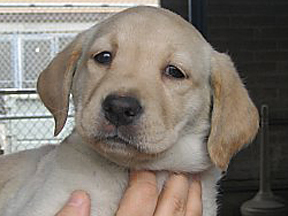 The kennel worker told me that these puppies are all picky eaters. From the notes on the kennel doors, it appears that some of them have had to have supplemental feedings. Sat, 6 Jan 2007 - Nell had 8 puppies. Three puppies born naturally on the January sixth. She had five (all in the same horn) by C-section, one yellow male lab was DOA. Five girls, two boys. Some are black and some are yellow. All are doing fine. Thu, 16 Nov 2006 - From Nell's breeder keeper, Jacquie: Alda's daughter, Nell (stud-Skipper,) was mated with Bob (charter stud) this last weekend. Alda's anticipated "Grandma" date is January 6, 2007. We're scheduling her Ultra-sound & will let you know the anticipated size of the litter. Tue, 15 Aug 2006 - Nell is officially a breeder now. She is living with a couple in San Francisco. 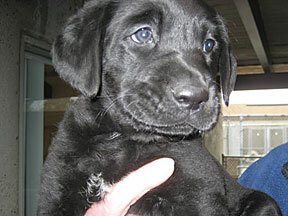 May 20, 2006 - Nell continues to be on the Breeder Watch List. If she continues to score well on her medical and temperament testing, she will remain on the list. 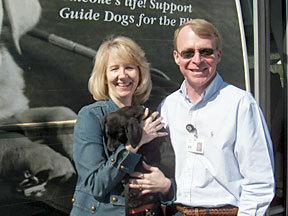 March 27, 2006 - Nell returned to GDB Oregon Campus to begin formal training. 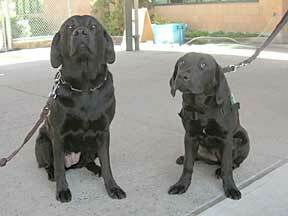 Nell with neighbor looking on while at Guide Dogs, California. If I heard correctly, she is raising one of Nell's pups. Copyright © 2005 Earthtravel.net. All rights reserved.